Morrine Brook, SRA photo, Nov 28, 2010. Walter Reagan of the Sackville Rivers Association told me about this area, saying that I had to see it. He said that DNR people had been there and been awed by it. So was I.
It’s a very striking topography, “rolling…with broad, smooth ridges and hollows generally following the northeast strike of the underlying bedrock” set on an overall hilly terrain. 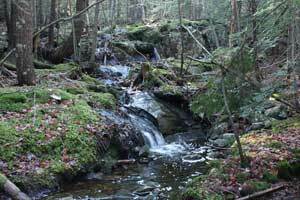 It is covered by a mostly coniferous forest of hemlock and spruce, with some white pine, red maple and the occasional yellow birch. (It is SH3 vegetation type in the FEC classification.) 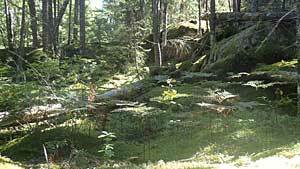 The rocky ground is almost completely covered by mosses and lichens; in some of the low areas between the parallel ridges, it is wet with sphagnum mosses and few or no trees. The area had been quite intensively harvested in the past, as revealed by he presence of stumps, some evidence of old logging routes and the absence of really big trees (dbh 2.5 ft or 75 cm +). But these were selective not clearcut harvests, the habitat remained intact and the forest maintains an uneven-aged structure. There are patches with trees around 50 cm dbh (diameter at breast height). For the most part, the trees are less than 12-14″ (30-35 cm) dbh, but are straight and tall. There are mountain bike trails in some of of the lower lying areas, and ATV routes along old logging roads. The one drawback is noise from the Bi-Hi (Bicentennial Highway) and from the rifle range. Perhaps the age of electric cars is coming soon and then vehicle noise will be a thing of the past. The shooting range is another story; at least the possibility exists that such noise could be restricted to certain hours or days (perhaps it already is). In any case, mountain bikers and ATVers seem quite happy as it is. There are places, nice places, for everyone in the SLPRP. I am averse to noise, but totally enjoyed my trek, and it fades as you get deeper in and down in the hollows between ridges. View Photo Album: Moraine Brook Hemlock-Spruce Forest.